Nacedero (Trichanthera gigantea (Humboldt & Bonpland.) Nees) is a multipurpose, versatile tree native of South America that thrives in a wide range of tropical ecosystems. It is used for fodder for pigs, rabbits and ruminants. Trichanthera gigantea is a small to medium sized shrub, generally about 5 m high but it can grow to a height of 12-15 m (Cook et al., 2005; Rosales, 1997). The crown is 6 m in diameter and the tree is many branched. Branches are quadrangular with rounded nodes and minutely haired tips. The leaves are oppositely borne on 1-5 cm long petioles. Leaf blades are 26 cm long x 14 cm broad, ovate to oblong in shape, dark green on the upper surface and paler on the underside. The inflorescences are compact terminal panicles bearing 10-20 bell-like flowers. The corolla is 3-4 cm long, red at the base and becoming yellow at the throat. Nacedero flowers have conspicuous, long, hairy anthers (the latin name Trichanthera means "hairy anther"). Fruits are dehiscent woody capsules, containing between 4 and 40 seeds, which split open once the seeds are mature (Cook et al., 2005; Rosales, 1997). Like all plants of the Acanthaceae family, Trichanthera gigantea forms cystoliths, which are small mineral concretions that appear as minute short lines on the upper surface of the leaves, the upper portions of the stems, on the branches of the inflorescences and on the calyx (Rosales, 1997). Nacedero foliage is traditionally used for pigs and rabbits. It is a source of forage in fodder bank systems (Keir et al., 1997b; Rosales, 1997). It makes valuable live fences that provide shade and forage (Cook et al., 2005; Rios-Katto, 2001; Rosales, 1997). Nacedero sprouts are edible and can be used in the preparation of maize porridge (Cook et al., 2005). Nacedero is reported to have several ethnomedicinal uses (a tonic for blood conditions, a treatment of nephritis and a lactogenic drink for nursing mothers) (Cook et al., 2005; Rios-Katto, 2001; Rosales, 1997). In Latin America, it is used to protect water courses (hence its name “madre de agua”), and has been abundantly planted around springs, river banks and wells to prevent water erosion (see Environmental impact below) (Rios-Katto, 2001). Trichanthera gigantea is native to the Andean foothills of Colombia. It is found in humid areas and wet forests of Central America and northern countries of South America: from Costa Rica and Panama, east through Colombia and western Venezuela, and south through Ecuador and Peru. It has been successfully introduced to Vietnam, Cambodia and the Philippines (Rosales, 1997; Cook et al., 2005). Nacedero is a very versatile species. It can be cultivated from sea level up to 2000 m. It grows on a wide range of soils, including those that are acidic and infertile with a pH as low as 4.5. Trichanthera gigantea does better where average temperatures are high (around 30°C) and where annual rainfall is in the range of 1500 mm to 3000 mm. It can grow in places where rainfall is lower (1000 mm), but then it drops its leaves during dry periods. It tolerates much higher rainfall (5000-8000 mm) provided that the soil is well-drained (Ecocrop, 2014). Nacedero is sensitive to frost which is one of its most important limitations. It is more productive under shade than in full-light and does better for instance under leucaena or banana shade (Cook et al., 2005; Rosales, 1997). Nacedero can be grown in association with forage trees such as Leucaena or Gliricidia, and in multi-strata agroforestry systems. It is successfully grown in banana plantations in Vietnam and in coffee plantations in Colombia (Cook et al., 2005; Rios-Katto, 2001). Trichanthera gigantea is generally propagated from cuttings selected at the basal part of young stems. These cuttings can either be planted directly or put in plastic bags for transplanting later. The best root development is obtained with 20 cm long, 2-3 cm diameter cuttings. After 50 days, roots are established and the cuttings produce new shoots that can be planted at 0.5-1 m spacing intervals in the field. This indirect planting method was reported to give good results but to be labour intensive (Moreno et al., 2005). Harvest begins 8 to 10 months after establishment and the first yields are about 15 t/ha of fresh matter. Trichanthera gigantea can be harvested for foliage every 3 months and yields 17 t/ha of fresh matter at a cutting height of about 1 m. Under hotter and drier conditions, cutting heights can be higher (1.3-1.5 m) (Rosales, 1997). In acid infertile soils, nacedero was reported to yield 3-6 t DM/ha at densities ranging from 10,000 to 40,000 plants/ha. Nadecero responds positively to N fertilizer (optimal level being 160 kg/ha/year). Up to 12 t DM/ha have been obtained under favourable growing conditions (Ecocrop, 2014; Suarez et al., 2006; Cook et al., 2005). Nacedero withstands regular and repeated cuttings, even without fertilizer application. For this reason, it has been suggested that, in spite of not being a legume, nacedero may be able to fix N with the help of a mycorrhiza or other organisms (Rosales, 1997). Nacedero can be planted as a live fence and to prevent water erosion. In Colombia, it has been increasingly used in afforestation programmes in coffee plantations and to prevent bank erosion around water springs and along the banks of rivers (Corpoica, 2013; Rios-Katto, 2001; Rios, 1993 cited by Martinez, 2008). Nacedero foliage is relatively rich in protein (13 to 22% DM), though lower values have been recorded (Rosales et al., 1999; Rosales, 1997; Nguyen Xuan Ba et al., 2003). Most of the crude protein is true protein and the balance of amino acid appears to be good (Rosales et al., 1999; Rosales, 1997). The ash content (often more than 20% DM) and more specifically the calcium content has been found to be particularly high compared with other fodder trees (Garcia et al., 2008; Rosales, 1997). This can be explained by the presence of cystoliths in the leaves, which may help to explain why, on farms in Colombia, nacedero is used as a lactogenic drink, which may have potential for feeding lactating animals (Rosales, 1997). The fibre content is extremely variable, with reported NDF values ranging from 33 to 66% of the DM. Nacedero foliage is free from alkaloids and condensed tannins, with low contents in saponins and steroids. Phenol content was extremely variable, from 0.045 to 5% of DM, which has been suggested to be the cause of the large variations of nutritional value observed in feeding trials with Trichanthera gigantea. The tannins from nacedero may be of the hydrolysable type (Rosales, 1997). In Venezuela, in a comparison of 11 other forage tree species, nacedero had no detectable concentrations of coumarins, saponins, or bitter compounds, low concentrations of alkaloids and moderate contentrations of terpenes (Garcia et al., 2008). Fresh nacedero foliage is used as a protein supplement for sheep and goats, but data are lacking for cattle (Hess et al., 1998; Keir et al., 1997a; Nguyen Thi Duyen et al., 1996; Vargas, 1993). It has been evaluated for ruminant feeding in South America and South-East Asia since the 1990s with mixed and variable results, which is probably due to its highly variable nutritive value (Rosales et al., 1999; Hess et al., 1998; Rosales, 1997; Keir et al., 1997a; Nguyen Thi Duyen et al., 1996; Vargas, 1993). Its palatability is only moderate (Garcia et al., 2009; Garcia et al., 2008; Mejia et al., 1993). Animals appear to need a period of adaptation to nacedero (Rosales, 1996). 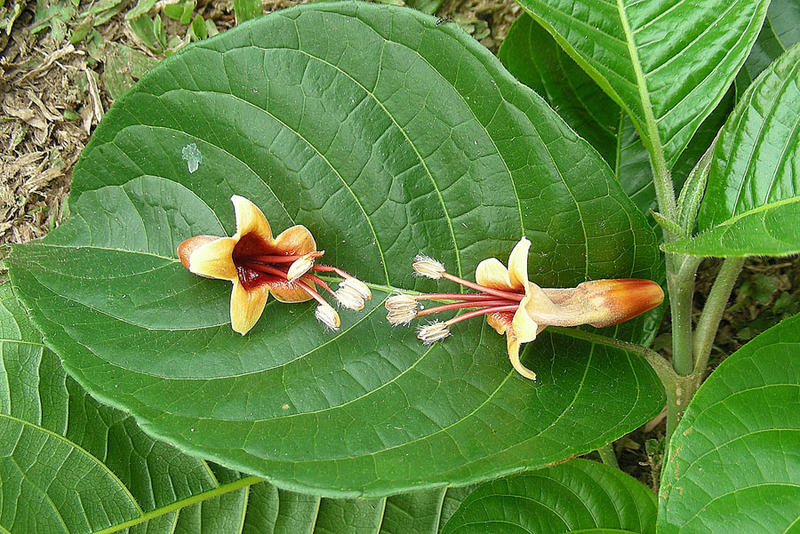 Unlike other tropical plants, nacedero has poor anthelmintic properties (Rios de Alvarez et al., 2012). The relative intake of nacedero foliage by goats and sheep was only moderate or low in comparison with other forage trees or shrubs in Colombia and Venezuela (Garcia et al., 2009; Garcia et al., 2008; Mejia et al., 1993). It was suggested that the lower palatability of nacedero leaves could be due to their slightly hairy surface (Keir et al., 1997b). In Colombia, the intake of nacedero by weaned African Hair sheep was much lower than that of gliricidia (Gliricidia sepium), but higher than that of leucaena (Leucaena leucocephala). Animals needed time to adapt to nacedero before being able to consume it in appreciable quantities (Mejia et al., 1993). In Venezuela, in a free-choice trial comparing 12 forage tree species, nacedero intake by dry Creole goats was intermediate (Garcia et al., 2008). Intake of nacedero by cattle, sheep and goats remained low in free-choice trials compared to that of Maclura tinctoria, Morus alba and Balizia pedicellaris, and high compared with that of Leucaena leucocephala, Moringa oleifera, Azadirachta indica and Albizia saman. Nacedero intake increased gradually during the first 3 days that the goats were offered this forage and then levelled off (Garcia et al., 2009). A large variability in the nutritive value of nacedero, due to climate, soil and genetics has been observed (Rosales et al., 1999; Suarez Salazar et al., 2008). Nacedero forage has a high fermentation rate, due to its high concentration in carbohydrates, with most fermentation occurring during the first 12 hours (Rosales, 1996). Rumen degradation is characterized by high fractions of soluble and potentially degradable DM (Edwards et al., 2012; Naranjo et al., 2011; Nguyen Xuan Ba et al., 2003). However, the rumen degradation rate of the protein was relatively low compared to that of other forage tree species (Edwards et al., 2012; Naranjo et al., 2011). This could be explained by the presence of phenols, which can be significant though highly variable (Galindo et al., 1989; Rosales, 1997). There may be more hydrolysable than condensed tannins and, therefore, have a higher capacity to react with protein (Rosales, 1997). Thus, the relatively high level of rumen undegradable protein in nacedero foliage suggests that it may be a good source of bypass protein, though this was not confirmed in a comparative digestibility trial (Edwards et al., 2012). In Vietnam, nacedero foliage gave poor results when it was used as the sole forage in diets for growing goats with access to multinutrient blocks. Nacedero had a similar protein content as jackfruit (Artocarpus heterophyllus) foliage. However, rumen degradability of DM, feed intake (9.8 g vs. 50 g DM /kg LW) and weight gain (-70 g/d vs. +69 g/d) were all lower with nacedero compared to jackfruit. The low DM content of nacedero leaves may have contributed to their low intake (Keir et al., 1997b). The need for a period of adaptation may explain the low intake and the loss of weight (Rosales, 1997). Nacedero foliage can be used as a protein supplement in low quality forage-based diets. In Colombia, nacedero foliage (3 kg per 100 kg liveweight) as a supplement for young African Hair sheep, fed a basal diet of pressed sugar cane stalks and a multinutrient block (10% urea), increased feed intake similarly to Gliricidia sepium and Erythrina poeppigiana (Vargas, 1993). In African-type sheep, supplementation with 20 or 40% nacedero (DM basis) of a Dichanthium aristatum hay-based diet improved both intake and digestibility of the diet. In this experiment, the protein content of nacedero was much higher than that of the basal forage (16.6% vs. 3.4% of DM) (Hess et al., 1998). In Vietnam, lactating goats were offered high levels (50% DM basis) of forage tree foliages such as nacedero, jackfruit (Artocarpus heterophyllus), banana plants (Musa spp.) and Acacia mangium as supplements to a basal diet of rice straw and sugarcane tops. Nacedero resulted in the lowest milk production even though intake of Acacia mangium was lower. However, the protein content of nacedero foliage used in this experiment was particularly low (less than 13% DM) (Nguyen Thi Duyen et al., 1996). Fresh or dried nacedero foliage is commonly used in pig diets. It is considered to have a valuable composition and amino acid balance, including a favourable lysine content, for pigs (Leterme et al., 2005). However, intake and performance obtained with pigs fed nacedero foliage are not consistent. In vitro digestibility values reported for dried nacedero leaf meal are rather low: 44%, 30% and 18% for OM, DM and N digestibility, respectively (Pok Samkol et al., 2011; Ly et al., 2001a). In Cuba, in a comparison of 12 forage tree species nacedero was among the least digestible (Pok Samkol et al., 2011; Ly et al., 2001a). Nacedero leaf meal was shown to have variable in vivo digestibilities in pigs: 47% for DM, 44-71.5% for OM, 33-75% for N and 51% for energy (Leterme et al., 2005; Seijas et al., 2003; Ly et al., 2001b). Estimated digestible protein and energy contents were 6% DM and 7-8 MJ/kg DM, respectively (Leterme et al., 2005; Seijas et al., 2003). 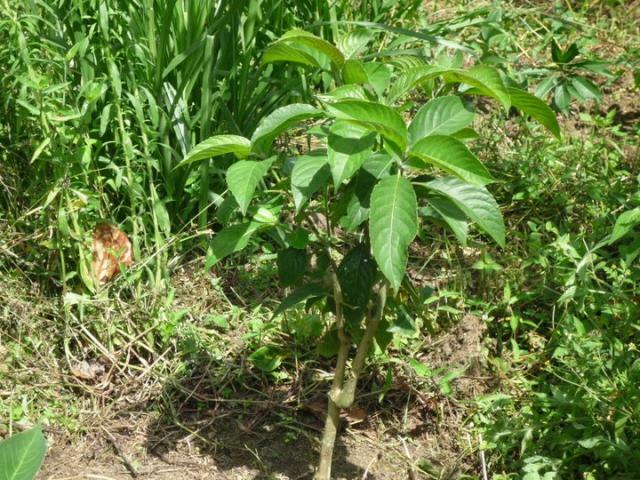 Nacedero leaf meal was less digestible than other forage tree species such as malanga (Xanthosoma sagittifolium) and white mulberry (Morus alba) (Leterme et al., 2005). The effect of nacedero on the diet digestibility in pigs is variable. While some authors reported that 20% inclusion of nacedero leaf meal had no effect on the digestibility of a maize-soybean meal basal diet, other experiments showed that inclusions as low as 10% nacedero leaf meal in the diet decreased faecal and ileal DM and N digestibilities (Leterme et al., 2003). In young sows (100 kg), daily voluntary DM intake was reported to be 515 g DM or 16.2 g DM/kg BW0.75 for fresh nacedero leaves and 33.6 g DM/kg BW0.75 for dry leaf meal (Leterme et al., 2005). Results with growing and finishing pigs have been neither satisfactory nor consistent. In Colombia, the inclusion of relatively small amounts of nacedero leaves in diets for growing pigs, replacing 5% of the soybean meal protein resulted in significantly lower performance. Intake and growth decreased linearly with increasing nacedero substitution (replacing from 5 to 25% of the protein), and feed conversion ratio deteriorated from 3.0 to 3.89 (Sarria et al., 1991). In Venezuela, nacedero leaf meal was included in the diet of finishing pigs (over 50 kg) at 10% of the diet, in combination with cassava leaf meal and cassava root meal, without hampering pig performance and carcass traits (Jimenez et al., 2005). However, in fattening pigs fed sweet potato root meal and nacedero leaves included at 8 to 24% (DM basis), body weight gain and feed conversion ratio deteriorated significantly compared to the control diet (Araque et al., 2005). Nacedero leaves have been observed to be very palatable to sows (Sarria, 1994; Nguyen Thi Hong Nhan et al., 1999). In Colombia, gestating sows readily consumed up to 4 kg/d of fresh leaves, but body condition deteriorated rapidly when soybean meal was completely removed from the ration (Sarria, 1994). However, experiments with sows fed nacedero leaves as a partial replacement for soybean meal or soybean seeds have been more positive than with growing and finishing pigs. In gestating sows, when nacedero leaves replaced 75% of soybean meal in cane juice diets, litter size did not differ from that of the control group, and gain to weaning was slightly higher (Mejia, 1989 cited by Rosales, 1997). In a later experiment, performance and productivity traits (body condition, litter size, litter weight) were not altered when sows were fed nacedero leaves ad libitum as a partial replacement of soybean meal or seeds (about 30% of the protein) in a sugarcane juice-based diet (Sarria, 1994). In Vietnam, nacedero leaves used to supplement rice, and rice-bran based diets of lactating sows resulted in performance (body condition, litter size at birth and at weaning) similar to the control diet (Nguyen Thi Hong Nhan et al., 1999). The high protein content of nacedero leaves could be valuable for poultry feeding, despite a high fibre content that limits their energy value (Rosales, 1997). They can be an element of extensive poultry production systems based on alternative feed ingredients (Ruiz-Silvera et al., 2008). Some trials investigated the potential of nacedero in moderately intensive poultry production. In chickens, up to 15% of the soybean protein (corresponding to 5.5% of the soybean meal in the diet) was substituted with nacedero leaf meal without negative effects on growth or feed consumption (Sarria et al., 1995). In layers, 2 to 6% nacedero leaf meal fed with rice replaced maize grain without decreasing egg production, and feed cost was reduced. However, feed consumption decreased significantly at the 6% level of nacedero. A similar experiment in laying quails also showed that it was possible to replace maize by cassava and 6% nacedero leaf meal (Nguyen Thi Hong Nhan et al., 1997). Growing ducks performed well when they were given fresh nacedero leaves (about 60-70 g/day) in partial replacement of soybean meal or fish meal. An increase in skin pigmentation was observed (Nguyen Thi Hong Nhan et al., 1997; Nguyen Thi Hong Nhan et al., 1999). Nacedero leaves, fresh or dried, are used to feed rabbits in Central and South America. In Colombia, it is recommended to offer fresh leaves ad libitum, with sugarcane and other forages such as ramie (Boehmeria nivea) or cajan pea (Cajanus cajan) (Rios-Katto, 2001). A diet consisting of ad libitum nacedero foliage offered with a nutritional block (50% vinasse) was found economically profitable (Quintero et al., 2000). In Colombia, nacedero leaf meal was included at up to 30% in diets for growing rabbits, resulting in a daily weight gain of 32 g/d (Arango, 1990 cited by Rosales, 1997). In Tanzania, up to 27% of sun-dried Trichanthera gigantea was included in the diet of growing rabbits to promote feed intake and growth performance without influencing the feed conversion efficiency (Sarwatt et al., 2003). In Cuba, several trials have investigated the value of nacedero for rabbit feeding. In a comparison of nacedero, perennial soybean (Neonotonia wightii), cowpea (Vigna unguiculata) and Napier grass (Pennisetum purpureum), nacedero was found to have the highest in vitro DM digestibility (52%) obtained with rabbit caecal inoculum (Dihigo et al., 2004). In a comparison of nacedero, leucaena, white mulberry (Morus alba), pinto peanut (Arachis pintoi) and sweet potato, nacedero was found to have the lowest faecal DM and OM digestibility (47 and 37%, respectively) and a DE value of 7.8 MJ/kg DM (Nieves et al., 2008b). However, when included at 30% in pelleted diets, the ileal digestibility of a nacedero-based diet was similar to that of other forage-based diets for OM and DM, though it was lower for protein (Nieves et al., 2009). In a comparison of diet acceptability and intake in fattening rabbits fed the same foliages, pelleted diets containing 40% of nacedero leaves resulted in the best intake after leucaena (Nieves et al., 2005). A live weight gain of 9 g/d and a feed conversion of 4.7 have been obtained in guinea pigs (Cavia porcellus) fed on nacedero foliage, sugarcane juice and 30 g/d of protein supplement (40% protein) (Rosales, 1997). Arango, J. F., 1990. Evaluation of three levels of nacedero Trichanthera gigantea for the fattening of New Zealand rabbits. Tesis de Grado. Zootecnia. Universidad Nacional de Colombia, Palmira. CIPAV 1996 Arboles utilizados en la alimentacion animal como fuente proteica. Centro para la Investigacion en Sistemas Sostenibles de Produccion Agropecuaria. Cali, Colombia, 123 pp.